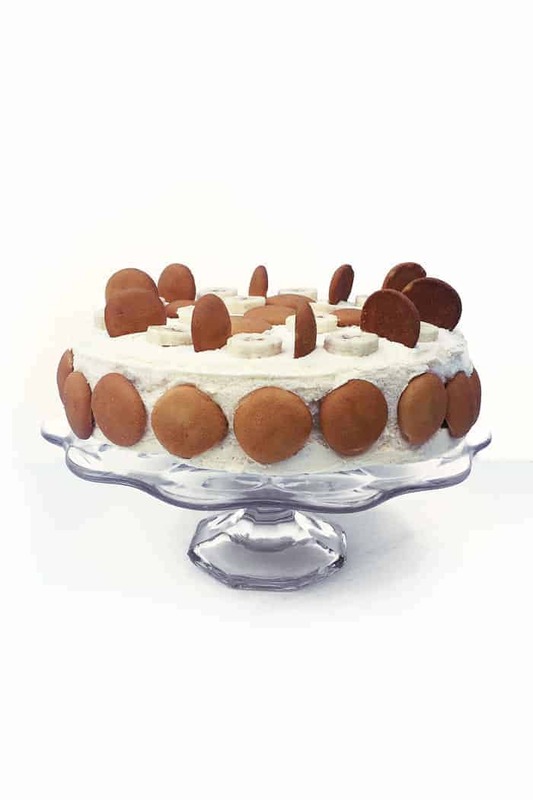 Banana Pudding Ice Cream Cake combines all the Southern charm of a classic dessert into a delectable frozen treat. Every summer barbecue in North Carolina has a few menu items in common. For starters, there’s almost always pulled pork, barbecue sauce, cole slaw rolls, deviled eggs, corn on the cob, macaroni & cheese, collard greens, baked beans. a fruit salad. a tossed salad, slices of watermelon, lemonade and sweet tea. Depending on what part of the state you’re from, there might be pickled beets, fried okra and biscuits or cornbread, too. Maybe hot dogs and hamburgers instead of the pulled pork. But by and large, these Southern cookouts are always epic. For dessert, there is always, always, always banana pudding and some kind of cake served with ice cream. “Why not together?” I asked. So I set out to make it happen. 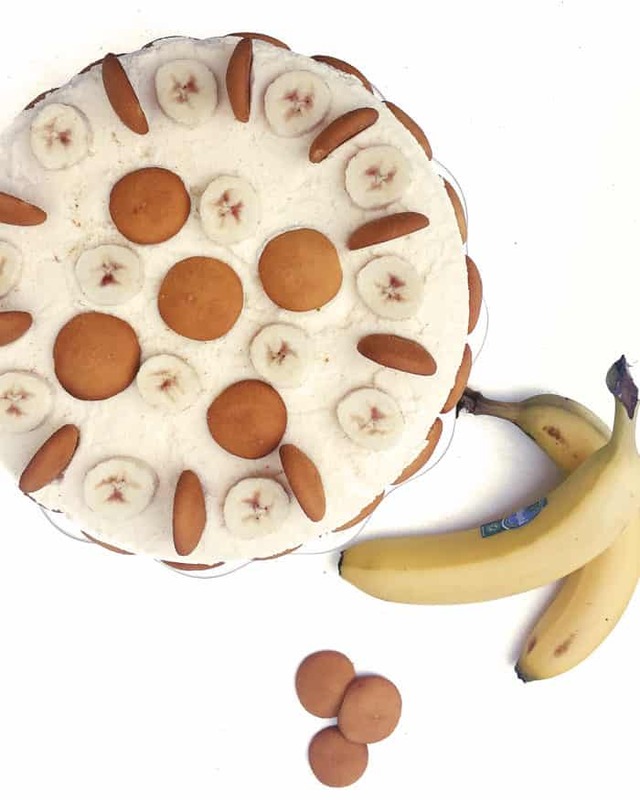 Even though I don’t love bananas, there’s something wonderful about the layers of boxed pudding, whipped cream, vanilla wafer cookies and banana slices. A big scoop of that and I’m flooded with memories of summer camp, tailgates and neighborhood barbecues. You probably knew this already, but you can make ice cream cake with any kind of ice cream. For today’s recipe, I made an ice cream cake version of my favorite cookout dessert. 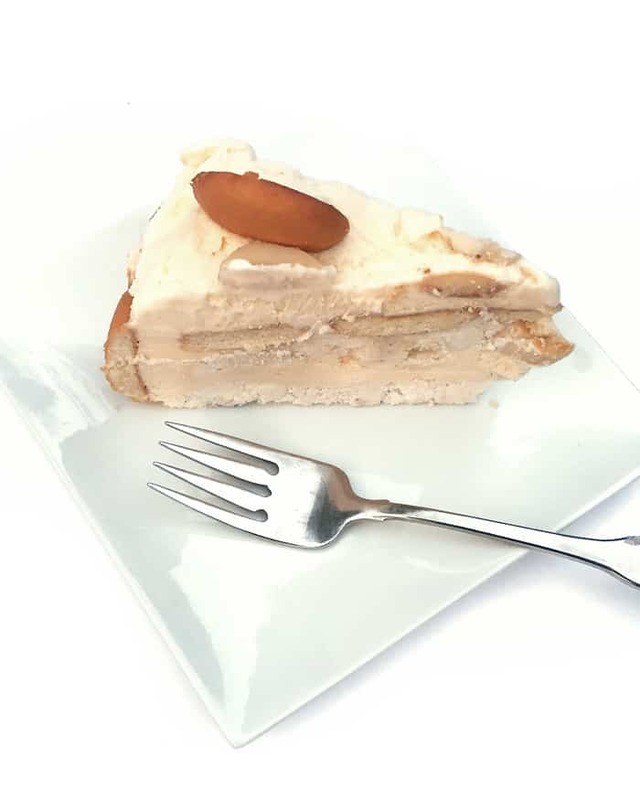 Layers of vanilla ice cream, whipped banana cream, vanilla wafers and banana slices come together in this luscious ice cream cake. Make it at least a day ahead of time so it has time to freeze! Making an ice cream cake is as simple as leaving the ice cream out on the counter for a bit to soften (not melt!) Once soft, spread it inside a springform pan (affiliate link) and layer it with toppings. The Southern cookbooks I mentioned are the cookouts I was raised on. They’re always the best when they’re potluck-style, and everyone brings something to the party. 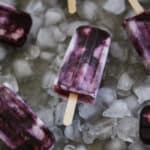 I teamed up with my friend Erin at The Speckled Palate to co-host a giant virtual cookout with our blog friends. 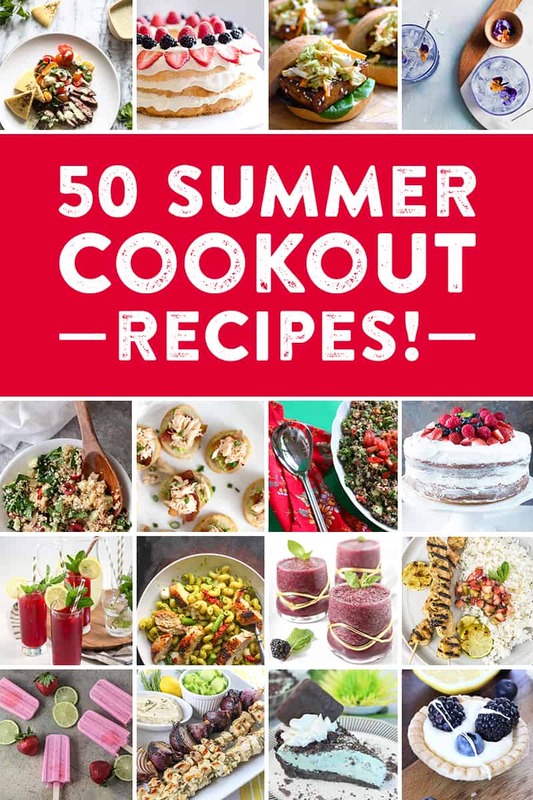 See all the recipes for our Great Blogger BBQ below! 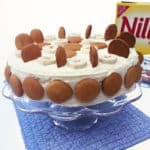 Banana Pudding Ice Cream Cake combines all the Southern charm of the classic fruity dessert with a delectable frozen treat. Chill a 9-inch springform pan in the freezer for 30 minutes 1 hour before beginning to prevent ice cream from melting. 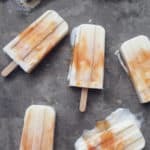 Allow ice cream to soften slightly (not melt) outside of the freezer for 15-30 minutes. Using a spoon, spread 1 quart of ice cream into the bottom of the springform pan and up around the sides of the pan. Smooth with a spatula or back of a spoon. Place in the freezer for 1 hour. While the outer layer sets, in a bowl, mash together cream cheese, sugar, 1/2 teaspoon vanilla and 1 banana until well blended and smooth. In the bowl of an electric mixer, whip cream with powdered sugar and 1/4 teaspoon vanilla until stiff peaks form. Fold half of the whipped cream mixture into the cream cheese mixture and mix well until smooth. Repeat with the second half of the whipped cream mixture. Cover bowl with plastic wrap and store mixture in fridge until needed. Into the springform pan with outer ice cream layer, spread half of the banana cream cheese mixture. Smooth with a spatula or back of a spoon. Press in a layer of vanilla wafer cookies. Add a layer of banana slices. Top with the remaining 1 quart of ice cream. Freeze for 1 hour. Add the remaining banana cream cheese mixture. Freeze for 3-4 hours or overnight. Before serving, pop open the springform pan and carefully turn out the cake onto a plate or baking sheet (make sure it fits in your freezer!) Smooth and patch the outer ice cream layer. Decorate with vanilla wafers and banana slices. Keep frozen. If not enjoying soon, cover loosely with plastic wrap and freeze for up to 1 month. 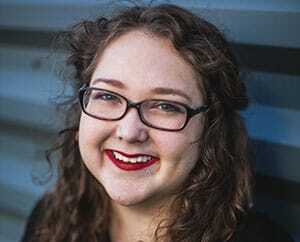 I am so thrilled to be part of this amazing virtual BBQ potluck party! Dessert is my favorite part at a party, and yours is super delicious! I love that it combines cake and ice cream, plus some fruit. How can it get any better 😉 ?? Thanks for putting this up with Erin! Oh, thank you Nicoletta! So glad you could join us! I love ice cream cake too! Oh girl, this is GENIUS! And putting this in a trifle is the best way to display it in all its gorgeous glory 😉 Thanks so much for organizing this fun BBQ! Love, love this combination of two of our Southern classics! 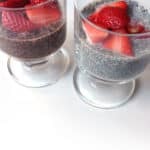 Definitely the perfect summer BBQ dessert – everyone will love it! Pinned! Thanks, too, for hosting our party – which we could all get together and eat ALL this delicious food! Thank you, Kathryn! That is my dream too, to make this barbecue a reality! Would be so much fun. Thanks for joining in! Aww, thanks Annie! I totally agree. We need to figure this out somehow. Thanks for participating and for your kind words about this recipe! I absolutely love every single thing about this cake! 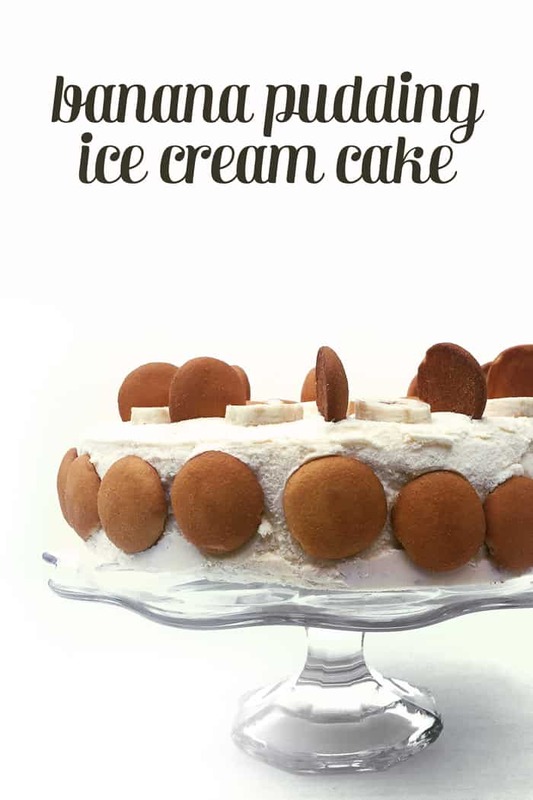 Banana pudding and ice cream all in one cake is genius! Well done, girlfriend! What a great idea!! Who doesn’t love ice-cream cake, especially during the warm Summer months. And who doesn’t love cake? Combine the two and you’ve got a winner! Yum! Thanks for joining us, Johlene! I too want to try all the recipes! Hope we can do another one of these soon. 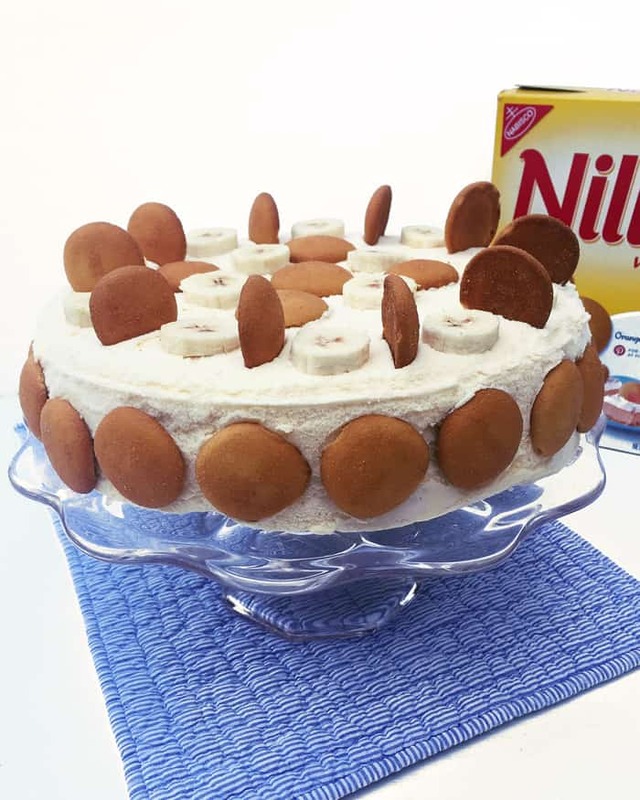 OMG, I loooove banana pudding, so turning it into an ice cream cake is an epic idea! This looks AH-MAZING! And dangerous, because I could totally eat the entire thing myself. 🙂 SO good! Thank you so much for organizing the Great Blogger BBQ! Such an honor to be apart of so much deliciousness! 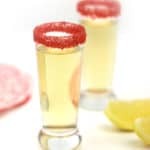 Cheers to a fabulous Memorial weekend! Your description of a Southern barbecue warms my heart because it reminds me of all the food I ate growing up at barbecues. Barbecues are different in Louisiana and Texas than they are in Tennessee (mainly… pulled pork. That’s what needs to be made and served. And ribs.) But they’re all so delicious and fun and the best for the summer months. While I cannot enjoy your banana pudding ice cream cake, you KNOW both my child and husband will go bonkers over this. And I plan to surprise them with this at some point during the summer months because I cannot wait to see their reaction! I’m so thankful we’re friends and pulled so many of our pals together to throw this ultimate Blogger Barbecue! SUCH a great idea, and it’s so fun seeing what everyone brought to the par-tay! Right? I love Southern barbecues too. I’m sorry you couldn’t much on a slice of this cake but I’d make you your own banana-less version for an IRL barbecue.